French toast you can eat with your hands and taste like ham and cheese toasties! 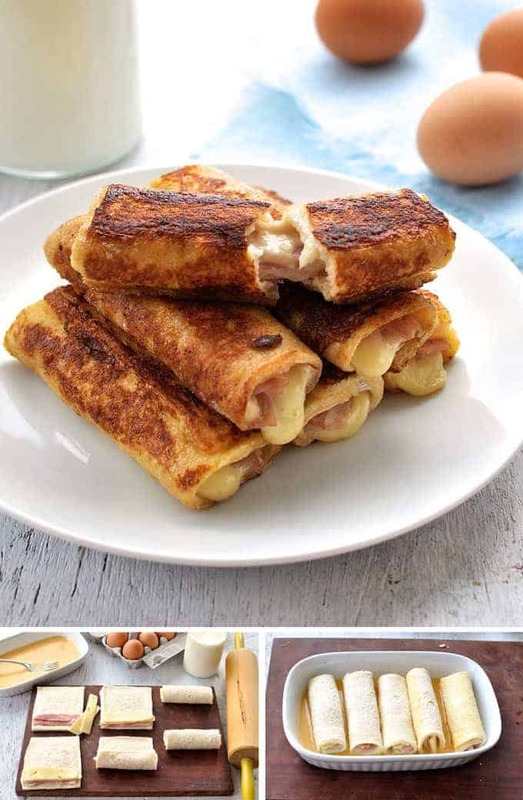 Fast to make, these Ham and Cheese French Toast Roll Ups are great for feeding an army AND you can even make them ahead. Win, win, win! I didn’t expect to post this recipe. I’ve seen countless french toast roll ups on the internet so I thought there was little point in adding mine into the mix. 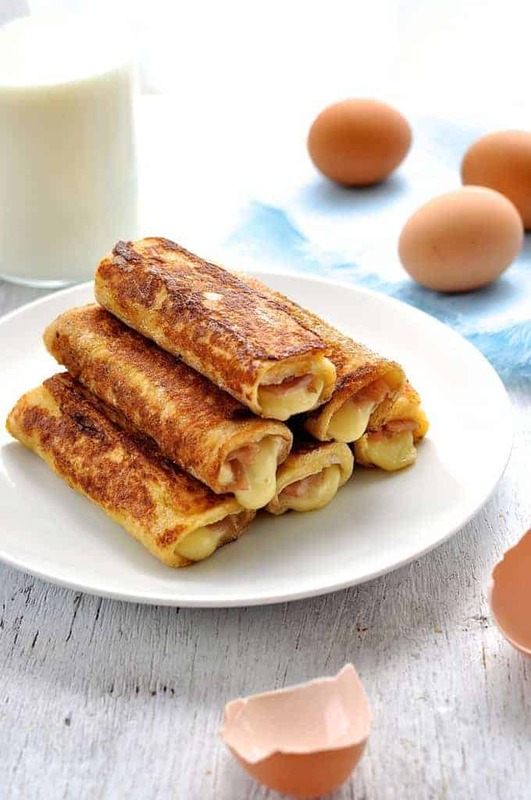 But the other day, I realised that all those french toast roll ups I’d seen were sweet ones, usually filled with cream cheese and berries, then coated in sugar. Whereas mine are savoury. 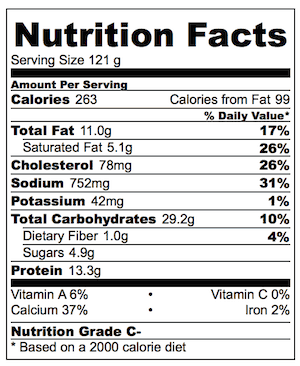 A quick google confirmed that french toast roll ups with ham and cheese inside them certainly aren’t a dime a dozen. In fact, when I Googled “ham cheese french toast roll up”, it return zero results. Lots of french toast roll ups (sweet), and ham and cheese french toast (sandwich style), but zero ham and cheese french toast roll ups. 1. You can eat it with your fingers. Because we all know that everything tastes better when you can use your hands! 4. You can make it ahead. Which I don’t bother doing if I’m only making one batch because these are so fast to make, but is really convenient if I’m cooking for a crowd. Now I really should keep writing and give you the “story” behind these and share some witty anecdotes, but I’m hungry so please excuse me. I want to get stuck into my breakfast! French toast you can eat with your fingers and taste just like ham and cheese toasties! This would also be great made with bacon or smoked salmon instead of ham. Optional - cut the crusts off the bread. Use a rolling pin to flatten the bread. Divide the ham between the bread and lay it out in a strip about 1cm / 1/3" wide along the bottom edge of the bread. Cut to fit neatly if necessary - that's what I did. Top each with 2 slices of cheese, or scatter grated cheese along the ham. Starting from the bottom, roll the bread up and finish with the seam side down. Place the egg, milk and salt in a flat dish and use a fork to whisk. Heat butter in a large fry pan over medium high heat. Dip the roll ups in the egg, rolling to coat all over. Then place in the fry pan. Place all roll ups in the same pan. Cook the roll ups for 45 seconds to 1 minute, then turn 90 degrees. Repeat again 2 more times (so 4 sides of each roll up is browned). 1. You must use fresh bread for this recipe, not stale bread (which I normally preach for french toast recipes). The reason is that fresh bread compresses better when you flatten it with a rolling pin (stale bread springs back) and also sticks to itself a bit when you roll it up, sealing the roll perfectly. 2. You can use any cheese you want for these, so long as it is a good melting cheese. I used Jarlsberg slices because that is what I had. Make sure each slice is roughly the size of the bread so when you cut the cheese into sticks, it will fill the width of the bread. You can use cheese sticks if you want, but I recommend cutting them in half lengthwise otherwise, I feel there is too much cheese for the amount of bread there is. Then cut them to length to the width of the bread before placing on it and rolling it up. You can also just use grated cheese. Just scatter a pinch along the length of the bread. 3. You can make these the night before (I haven't tried any longer than 12 to 15 hours ahead). 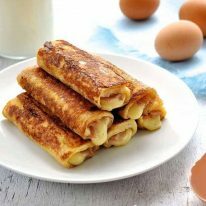 To make these ahead, roll up the french toast, then dip them VERY quickly in the egg mixture and shake the excess off. Then place them seam side down in a container or baking dish (you can stack them) so they fit snugly. Save the egg mixture. When you are ready to cook, preferably bring them to room temperature. Quickly dip the roll ups in the egg mixture again before cooking. There should be enough egg mixture because you just dip them in very quickly, as opposed to soaking them. The purpose of the first dip is to keep the bread moist and to ensure they stay rolled up. I found that sometimes (depending on the bread) the roll ups unrolled and dried out a bit. So a quick dip in the egg solved this. 4. Save the bread crusts! Here are two ideas for some nibbles you can make with them: Parmesan Thyme Bread Crust Treats and Cinnamon Sugar Bread Crust Treats. 5. Nutrition assumes this serves 3. Nagi your site is a bookmark on my browser, I’m finding myself a lot more in the kitchen since discovering RecipeTin Eats. I’m munching on these right now and they are soooo amazing. Tons of thank yous all the way from my kitchen in Cape Town, South Africa. I made these ham and cheese french toast roll ups. they turned out amazing. so delicious! thank you!! Made these beautiful rolls and they are excellent, why hadn’t I thought of this before? Did a Darryl tweak and added some finely chopped mushrooms. Thanks Nagi! Yum! Great Sunday night dinner, very filling. Will definitely make again. How well do they freeze? Im looking for a make ahead lunch for my family. They would love these. I already make the P.BJ. crustables for them for the week and looking for somethi g different. Hmm, I must say I haven’t tried freezing them but I think it will work great! I’d reheat them in the oven! Have you tried putting in mozzarella and pepperoni the rolling? OMG. 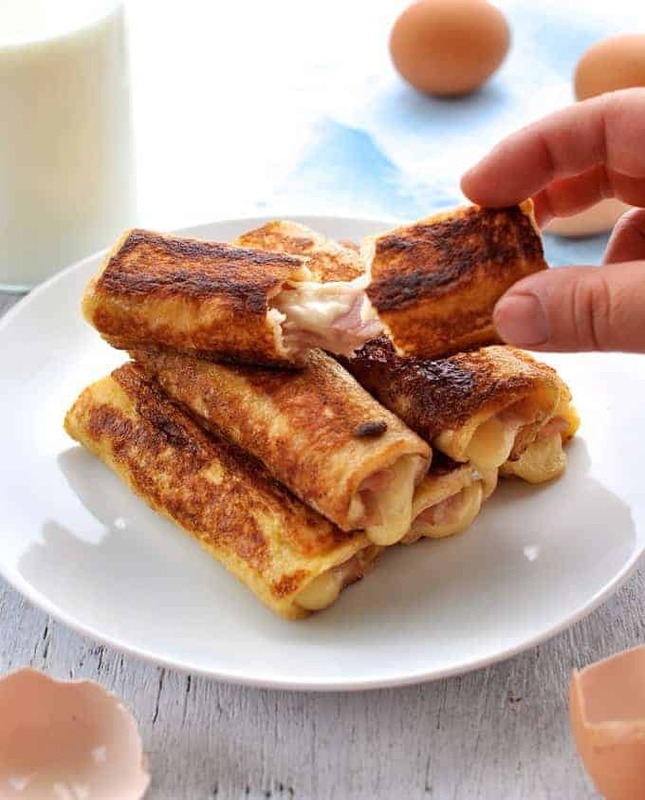 PIZZAA French Toast Roll Ups! YEE HA!!! How you manage to eat them with your fingers is beyond me…they were gone long before they were cool enough to touch 🙂 I made them with wholegrain toast and sliced chicken breast i had in my fridge…delicious! Has anyone tried cooking these the night before and reheating? Just wondering how well they reheat, would save some time. I’ve reheated leftovers! They work great! OK in microwave, even better in the oven! Brothers! Urrgh! Meanwhile I am totally enamoured with this fab do-ahead brunch idea. Clever you! Pinning. So glad you like the look of these!! I am obsessed with them 🙂 So delish! First thing I have ever cooked, gotta say, not bad, not bad at all, already wolfed down 6, gonna go make more now thanks for the recipe, really helpful. Just finished my two right now, cooked them with my mother. Absolutely delicious, and the goopy cheese went everywhere (And if pizza is any indication, it made it all the more better). Easy to cook, easy to eat, easy to want again.